This application protocol describes the isolation of highly purified and viable microglia from neonatal brain tissue. Brain tissue from mice or rats younger than P8 is dissociated into single-cell suspensions via enzymatic digestion of the extracellular matrix and gentle mechanical dissociation. CD11b (Microglia) MicroBeads, mouse or CD11b/c (Microglia) MicroBeads, rat are used to isolate microglia from the single-cell suspension. CD11b (Microglia) MicroBeads isolate CD11b+ cells, whereas the CD11b/c (Microglia) antibody appears to recognize a common epitope shared between CD11b and CD11c. CD11b, also known as integrin alpha M (ITGAM) or Mac-1, is a component of complement factor 3 (CR3). CD11c, also called integrin alpha X (ITGAX), is a component of complement receptor 4 (CR4). CD11b and CD11c are expressed on microglia, macrophages, monocytes, granulocytes, NK cells, and dendritic cells. MACS Columns and MACS Separators: Microglia can be enriched using MS or LS Columns, or depleted using LD Columns. Positive selection can also be performed using the autoMACS® Pro Separator or the MultiMACS™ Cell24 Separator. Fluorochrome-conjugated CD11b antibody, or CD11b/c antibody for flow cytometry analysis, e.g., CD11b-FITC (# 130-081-201), CD11b-PE (# 130-091-240), or CD11b-APC (# 130-091-241), or CD11b/c-FITC (# 130-105-273) and CD45, e.g., CD45-FITC (# 130-110-658), or CD45-APC (130-110-660). Learn more about our antibodies and dyes. Prepare the following cell culture medium: DMEM containing 10% FBS, 1% penicillin/streptomycin, and 2mM L-glutamine. Use the Neural Tissue Dissociation Kit (T) or the Neural Tissue Dissociation Kit (P) to dissociate brain tissue and prepare a single-cell suspension. Follow the protocol of the kit data sheet. Isolate microglia from the single-cell suspension using either the CD11b (Microglia) MicroBeads, human and mouse or the CD11b/c (Microglia) MicroBeads, rat. Follow the protocol of the corresponding kit data sheet. CD11b+ microglia isolated from neonatal mouse brain tissue. CD11b+ cells were isolated from mouse neural cell suspension using the CD11b (Microglia) MicroBeads, an MS Column, and a MiniMACS™ Separator. Cells were fluorescently stained with CD11b-APC and CD45-FITC. Cell debris and dead cells were excluded from the analysis based on scatter signals and propidium iodide fluorescence. CD11b/c+ microglia isolated from neonatal rat brain tissue. CD11b/c+ cells were isolated from P3 rat brain tissue using the Neural Tissue Dissociation Kit (P), the gentleMACS™ Dissociator, CD11b/c (Microglia) MicroBeads, a MiniMACS™ Separator, and two MS Columns. Cells were fluorecently stained with CD11b/c-FITC in combination with CD45-APC and analyzed by flow cytometry using the MACSQuant® Analyzer. Cell debris and dead cells were excluded from the analysis based on scatter signals and propidium iodide fluorescence. The recommended antibody dilution for labeling cells is 1:10 for up to 1×107 cells/100 μL of PB buffer. Volumes given below are for up to 1×107 nucleated cells. When working with fewer than 1×107 cells, use the same volumes as indicated. When working with higher cell numbers, scale up all reagent volumes and total volumes accordingly (e.g., for 2×107 nucleated cells, use twice the volume of all indicated reagent volumes and total volumes). Use 100 μL of the CD11b+ fraction for analysis. Optionally, also analyze 100 μl of the negative fraction and 20 μL of the original fraction. Resuspend up to 1×107 nucleated cells per 100 μL of PB buffer (see "Things to prepare in advance of cell isolation and cell culture"). Add 10 μL of CD11b-PE or other selected conjugated antibody. The recommended antibody dilution for labeling cells is 1:10 for up to 1×106 cells/50 μL of buffer. Use 100 μL of the CD11b/c+ fraction for analysis. Optionally, also analyze 100 μl of the negative fraction and 20 μL of the original fraction. Resuspend up to 1×106 nucleated cells per 45 μL of buffer. Add 5 μL of CD11b/c-PE or other selected conjugated antibody. Wash cells by adding 1 mL of buffer and centrifuge at 300×g for 10 minutes. Aspirate supernatant completely. Resuspend cell pellet in a suitable amount of buffer for analysis by flow cytometry, e.g., using the MACSQuant Analyzer 10. Plate 1×105 cells in 50 μL of pre-warmed prepared medium as a drop in the middle of each well of a coated 24-well plate (see "Things to prepare in advance of cell isolation and cell culture"). Let cells settle down for 30 minutes at 37 °C in the incubator. ▲Note: When working with CD68 antibodies, add 0.2% TRITON™ X-100 in PBS, incubate for 10 minutes at room temperature, and wash cells 3× with autoMACS Running Buffer. Add primary antibody in staining buffer to the cells with a final concentration of 5–10 μg/mL and incubate at room temperature in the dark for 10 minutes. Add a corresponding secondary antibody in staining buffer to the cells. When working with CD11b antibodies: Incubate at room temperature in the dark for 10 minutes. When working with CD68 antibodies: Incubate at room temperature in the dark for 1 hour. Successful culture of microglia isolated from neonatal mouse brain tissue. Neonatal mouse whole brains were dissociated with the Neural Tissue Dissociation Kit (P). Subsequently, microglia were isolated using the CD11b (Microglia) MicroBeads. Microglia were cultured in DMEM, 10% FCS, 1% P/S and 2 mM L-glutamine on PLL-coated glass coverslips (1×105 cells per well of a 24-well plate). Cells were fixed and stained with the microglia-specific antibodies CD45 (A) and CD11b (B). Neonatal mouse whole brains were dissociated with the Neural Tissue Dissociation Kit (P). Subsequently, microglia were isolated using the CD11b (Microglia) MicroBeads. Microglia were cultured in DMEM, 10% FCS, 1% P/S, and 2 mM L-glutamine on PLL-coated glass coverslips. 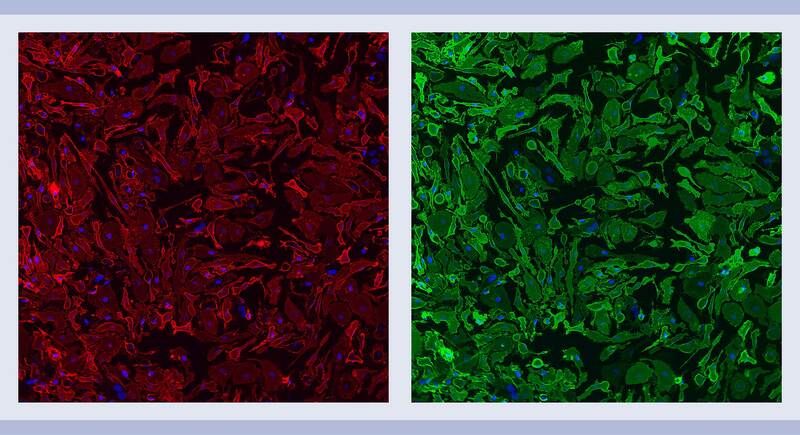 Cells were fixed and stained with the microglia-specific antibodies CD11b (A) and CD45 (B).